As one of the main cathode materials for lithium-ion batteries, lithium iron phosphate (molecular formula is LiFePO4, also known as LFP) features such strengths as high safety, long cycle life, and high temperature resistance. But its weakness is lower energy density. Lithium iron phosphate batteries can be used in electric vehicles, power tools, electric bicycles, energy storage devices, etc. For now, they are mainly used as power batteries for electric vehicles. In 2014, some 12,500 tons of lithium iron phosphate were sold globally, and they were mainly sold to China, almost accounting for 75% of the total. That was mainly because Chinese electric vehicle enterprises tend to adopt lithium iron phosphate as power batteries of cathode materials. Additionally, China's great support for new energy vehicles has promoted the rapid increase of the country’s demand for lithium iron phosphate. In contrast, cathode materials for power batteries in the US, Japan, and South Korea are dominated by ternary material and lithium manganate. Globally, the traditional lithium iron phosphate material manufacturers mainly include the U.S.-based A123 and Valence and the Canada-based Phostech, which grasp mature mass-production technology. However, the demand for lithium iron phosphate battery in the US and European countries showed an ongoing decline, a situation that plunged them into financial difficulties. For example, A123 filed a petition in bankruptcy in October 2012, and was finally acquired by China’s Wanxiang Group; Valence retreated from NASDAQ in July 2012 as it had long been in the red. 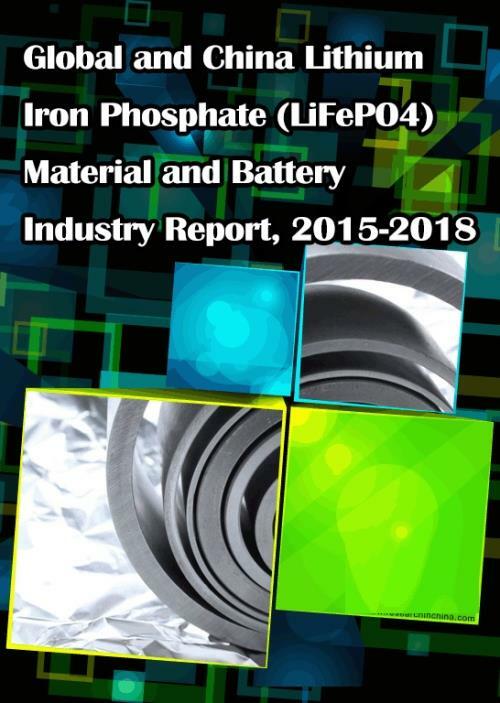 In recent years, however, lithium iron phosphate enterprises in Mainland China and Taiwan have been developing very fast, accompanied by dramatic capacity expansion and rising market position. By the end of 2014, over 80% of the world’s lithium iron phosphate originated from Mainland China and Taiwan, of which the Taiwanese lithium iron phosphate material manufacturers were mainly Formosa and Aleees, of which total capacity approximated 7,300 tons in 2014. In 2014, Mainland China recorded a total capacity of about 30,000 tons of lithium iron phosphate. The major enterprises included Tianjin STL Energy Technology Co., Ltd., Guanghan Mufu Lithium Power Materials Co., Ltd., and Pulead Technology Industry Co., Ltd., etc. which contributed a combined capacity of 9,500 tons. Furthermore, there are several proposed and ongoing lithium iron phosphate projects in China. For example, Tianjin STL Energy Technology planned to expand its lithium iron phosphate capacity to 10,000 tons within three years; Pulead Technology’s Base in Qinghai is working to construct a “5,000 tons/a lithium iron phosphate and other cathode materials” project (Phase II). In terms of EV industry, China’s mainstream cathode materials for power batteries are still lithium iron phosphate, which represents an around 40% share of power battery market, Major manufacturers consist of BYD, Guoxuan High-Tech, and Tianjin Lishen, etc. However, low energy density of lithium iron phosphate batteries restricts the EV’s driving range, a situation that makes more and more enterprises turn to ternary materials. In the future, the application percentage of lithium iron phosphate batteries in electric vehicles will fall. However, the application of lithium iron phosphate batteries in energy storage, photovoltaic and communication batteries is on the rise, reflecting a huge space for development. In the field of electric bicycles, the batteries have obvious advantages over the traditional lead-acid batteries, hence a larger alternative space. - Operation, lithium iron phosphate battery business, etc. of 11 lithium iron phosphate battery companies in China. 5.4 Formosa Energy & Material Technology Co., Ltd.
5.8 Tianjin STL Energy Technology Co., Ltd.
5.11 Yantai Zhuoneng Battery Material Co., Ltd.
5.12 Nanjing Lasting Brilliance New Energy Technology Co., Ltd.
5.13 Guanghan Mufu Lithium Power Materials Co., Ltd.
5.14 Hunan Shanshan Advanced Materials Co., Ltd.
5.15 HeFei GuoXuan High-Tech Power Energy Co., Ltd.
5.16 ShenZhen TianJiao Technology Development LTD.
5.17.1 Xinxiang Huaxin Energy Materials Co., Ltd.
5.17.2 Hunan Haorun Technology Co., Ltd.
5.17.3 NanoChem Systems (Suzhou) Co., Ltd.
5.17.4 Xinxiang Chuangjia Power Supply Material Co., Ltd.
5.17.5 QingDao Qianyun High-tech New Material Co., Ltd.
6.3 Tianjin Lishen Battery Joint-Stock Co., Ltd.
6.4 Shenzhen Mottcell Battery Technology Co., Ltd.
6.5 Wanxiang EV Co., Ltd.
6.6 CENS Energy-Tech Co., Ltd.
6.7 Hipower New Energy Group Co., Ltd.
6.8 Suzhou Golden Crown New Energy Co., Ltd.
6.11 Huanyu Power Source Co.,Ltd. History of LiFePo4 R&D of Tatung Fine Chemicals Co., Ltd.
- CENS Energy-Tech Co., Ltd.